Like dancers in a chorus line, atoms' movements become synchronized when lowered to extremely cold temperatures. To study this bizarre phenomenon, called a Bose-Einstein condensate, researchers need to cool atoms to a temperature just above absolute zero - the point at which atoms have the least energy and are close to motionless. The goal of NASA's Cold Atom Laboratory (CAL) is to study ultra-cold quantum gases in a facility instrument developed for use on the International Space Station. Scientists will use the facility to explore how differently atoms interact in microgravity when they have almost no motion due to such cold temperatures. With less pull toward the ground from Earth, matter can stay in the form of a Bose Einstein condensate longer, giving researchers the opportunity to observe it better. 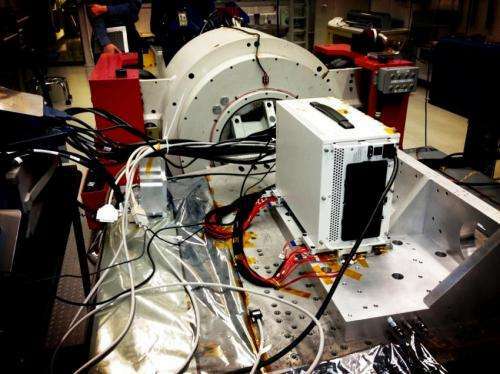 The CAL team announced this week that it has succeeded in producing a Bose-Einstein condensate at NASA's Jet Propulsion Laboratory, a key breakthrough for the instrument leading up to its debut on the space station in late 2016. A Bose-Einstein condensate is a collection of atoms in a dilute gas that have been lowered to extremely cold temperatures and all occupy the same quantum state, in which all of the atoms have the same energy levels. At a critical temperature, atoms begin to coalesce, overlap and move in synch. The resulting condensate is a new state of matter that behaves like a giant - by atomic standards - wave. "It's official. CAL's ground testbed is the coolest spot at NASA's Jet Propulsion Laboratory at 200 nano-Kelvin [200 billionths of 1 Kelvin]," said CAL Project Scientist Rob Thompson at JPL in Pasadena, California. "Achieving Bose-Einstein condensation in our prototype hardware is a crucial step for the mission." Although these quantum gases had been created before elsewhere on Earth, CAL will explore the condensates in an entirely new regime: the microgravity environment of the space station. It will enable unprecedented research in temperatures colder than any found on Earth. In the station's microgravity environment, long interaction times and temperatures as low as one picokelvin (one trillionth of one Kelvin, or 293 trillion times less than room temperature) should be achievable. That's colder than anything known in nature, and the experiments with CAL could potentially create the coldest matter ever observed in the universe. These breakthrough temperatures unlock the potential to observe new quantum phenomena and test some of the most fundamental laws of physics. The CAL investigation could advance our knowledge in the development of exquisitely sensitive quantum detectors, which could be used for monitoring the gravity of the Earth and other planetary bodies, or for building advanced navigation devices. 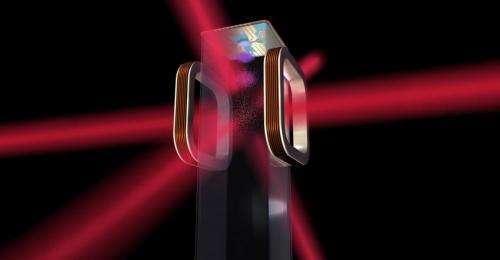 "Ultra-cold atoms will also be useful for space-based optical clocks that will be future time standards," Thompson said. 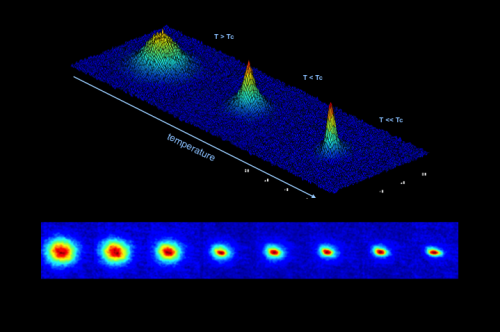 First observed in 1995, Bose-Einstein condensation has been one of the "hottest" topics in physics ever since. The condensates are different from normal gases; they represent a distinct state of matter that starts to form typically below a millionth of a degree above absolute zero. Familiar concepts of "solid," "liquid," and "gas" no longer apply at such cold temperatures; instead, atoms do bizarre things governed by quantum mechanics, such as behaving as waves and particles at the same time. CAL researchers used lasers to optically cool atoms of the chemical element rubidium to temperatures almost a million times colder than that of the depths of space. The atoms were then magnetically trapped, and radio waves were used to cool the atoms 100 times lower. The radiofrequency radiation acts like a knife, slicing away the hottest atoms from the trap so that only the coldest remain. JPL is developing the Cold Atom Laboratory sponsored jointly by the Space Life and Physical Sciences Division of NASA's Human Exploration and Operations Mission Directorate at NASA Headquarters in Washington and by the International Space Station Program at NASA's Johnson Space Center in Houston. While so far CAL researchers have created Bose-Einstein condensates with rubidium atoms, eventually they also will add in potassium. "The behavior of two condensates mixing together will be fascinating for physicists to observe, especially in space," Sengupta said. Besides merely creating Bose-Einstein condensates, CAL provides a suite of tools to manipulate and probe these quantum gases in a variety of ways. CAL has a unique role as a facility for the atomic, molecular and optical physics community to study cold atomic physics in microgravity, said David Aveline of JPL, CAL ground testbed lead. You may have thought that the coldest place in the universe might be a vast tract of space between distant stars. But in a couple of years, the coldest place we know of will be orbiting our own planet, creating atomic dances to dazzle the scientific imagination.